Who’s Looking After The Zebras? When you hear hoofbeats think horses not zebras. That’s what medical students are taught during training. That, when you have a patient with a list of symptoms, reach for the more common, more likely diagnosis, rather than the rare diagnosis. Because the rarer diagnosis sticks in the mind more easily, students tend to reach for it, maybe more often than they should, so this phrase was started and has stuck. But the problem is, that is has stuck so hard that doctors don’t even consider that they could have a zebra in front of them. And even if that zebra is a real, genuinely diagnosed zebra, they can still be disbelieving. This is difficult to get used to. The Ehlers-Danlos charities and Hypermobility charities around the world have adopted the zebra as their mascot because of what it represents. 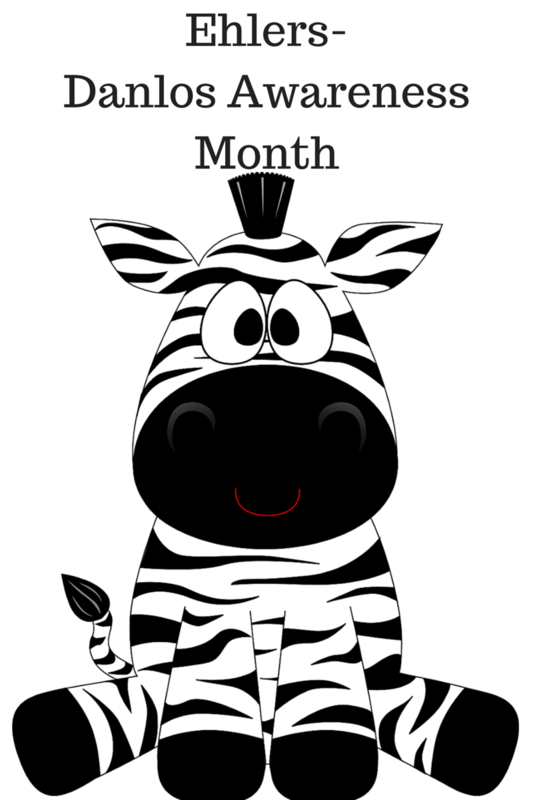 May is Ehlers-Danlos Awareness month. And because of that, it is in this month that I’m going to tell you what happened during my trip to the United States last month. I visited a neurosurgeon over there because I’m a diagnosed zebra and over here, in the UK, I was invisible. I was, I am, in, unbearable pain in my neck and head and have many other symptoms to go along with that. But because doctors don’t take the EDS into account when asked to figure out what is causing my neck problem, it wasn’t investigated in the right way, causing me to seek help elsewhere, help in a place where I knew the doctor understood the zebras. The reason it has taken me so long to update you on what happened over there is because I was left stunned and shocked. Yes, I went over there knowing something was seriously wrong with my neck and hoping to finally be told I was right. But knowing it and being told that, are two different things. I felt as though I’d been hit by a bus. I also couldn’t believe how shocked I was. I took me weeks to get my head around it. Days before I could even really talk about it. I have two problems in my neck and a TMJ problem – which is my jaw. The jaw problem – my jaw isn’t stable and comes out of place – is causing some of my headaches. The two issues in my neck – the main one, causing all the pain and symptoms is atlanto axial instability. Which is my C1/2 moving about where they shouldn’t, on rotation mostly. Causing some minor neurological issues. He said this can be stabilised with surgery and that it could probably be done in the UK because this surgery does get done in the UK. If I can’t find a surgeon to do it, then I can go back to the US and the diagnosing doctor will do it. The other issue is instability at C4/5/6 with minor subluxation and some disc bulging with minor spinal cord impingement. There are no current symptoms from this but the train of thought from patients who have been stabilised in one place is that once done, the other less stable structures then struggle to maintain what stability they have. So, I have that to look forward to. Now, I have to find a neurosurgeon who will agree to see me and who will assess me as a zebra. A patient who is different to their other patients. A patient whose body works in an entirely different way. Gravity makes a difference and movement, and they need to believe me when I say how bad it is and how bad my quality of life is, because when I walk into their office, I am more than likely going to look fine. I can’t leave my house without having a shower first and drying my hair. This makes me look human. But because I can get clean, does not mean my body is functioning like it should do or that I am in less pain than I’m saying I’m in. And even if I can get someone to assess me as a zebra, I then need them to agree with the diagnosis and then agree to surgery. Otherwise, I have to find a lot of money to go back to the States so I can have the back of my head cut open in a foreign country when I’d much rather be at home for something so drastic. Going over to America has been the start of a journey, I still have some distance to go if I want my neck stabilising so that I can have some quality of life back. And that’s not too much to ask is it? Really? It’s about time the above phrase was phased out. It leaves the zebras out in the cold with no one to care for them. < Previous Writing Crime – Do Detectives Carry Handcuffs? Thank you x I’m glad that there are some out there who remember to think about the zebras, because it really is a hard battle against closed minds and any open mind is worth a lot. I’m keeping my fingers well and truly crossed but I’m not sure how much I really believe I’ll get what I need here. Not at all. I know how many people see the police and yes, there are different officers within each department. Thank you, Pam. Keeping my fingers crossed. With this new documented evidence, you should have a better response in UK? I hope so, for it is high time our doctors and surgeons realised that we instinctively know when something is wrong with us, and they should listen to us… better yet, do something about it. Fingers crossed, but I’m still sceptical unfortunately. But it would be helpful because I’d rather have such massive surgery here at home than so far away. Plus there is the cost implication. And how I’ll be perceived if I have it done abroad. I’m sorry. You wanted answers though. You have the diagnosis. The US doctor can also communicate with the UK doctor. Don’t take no for an answer. You’re right, it would be much better to get it done there. You’re right, the US doctor is lovely and is happy to liaise with any UK doctor that may take this one. Fingers are crossed! Thanks for sharing your story, Rebecca. I’m so very glad that you found someone to actually pay attention to what they were seeing, and recommend some treatments that might give you some relief. I can understand how hard it was to hear what the doctor said, but it’s good to know the truth – the answers. I hope that you’ll be able to get the surgery you need soon. Thanks, Margot. I’ve had so much support as I’ve gone through this journey. I’m very lucky in that respect. Thank you. Thank you, Lesley. I’m sorry you and your family are struggling so much. I’ve heard about Dr Casey and may go and see him or try someone closer to home first. I’m not sure what to do. I’m currently still letting it mull over in my head at the minute. I hope things go well for you. Ah, it’s the constant battle against time as well – the pressure to diagnose quickly, rather than correctly, because in 85% or so of the cases it won’t matter that much if the diagnosis is just a ‘little’ wrong and the patient can come back and we can adjust… That’s what’s made me reluctant to seek medication for depression etc. etc. I’m glad you got some answers in the US, at least, although it seems to be just the first step on a long road… wishing you the best of luck, courage and advice as you continue on this road. I have nasty neck problems from my rheumatoid arthritis–not nearly as bad as yours. The big difference is my doctors are aware of the progression and ready to move me forward when needed. Of course, that all could change when our ACA health program becomes fully entrenched. Lots of doctors are leaving the profession. I wonder, could the diagnosing doctor refer you to a UK colleague, someone who would believe his diagnosis and move forward? Or does the ED organization have lists of doctors who are aware? My daughter had a deadly orphan disease when she was 4 and we tracked down the world expert in it. Everything fell into place once other doctors knew what this guy thought.